I love fajitas. They have been on my rotating meal plan ever since I was old enough to cook. I remember when I went away for a skating camp when I was 14, we each had to take turns cooking supper one night for the week and I brought stuff to make fajitas for everyone. 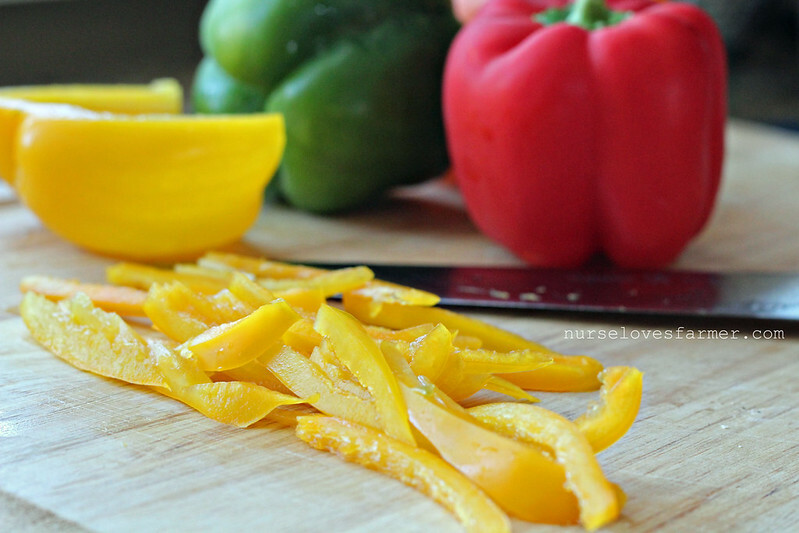 They’re that easy to make – as long as you can safely use a knife to chop veggies – you can make fajitas! 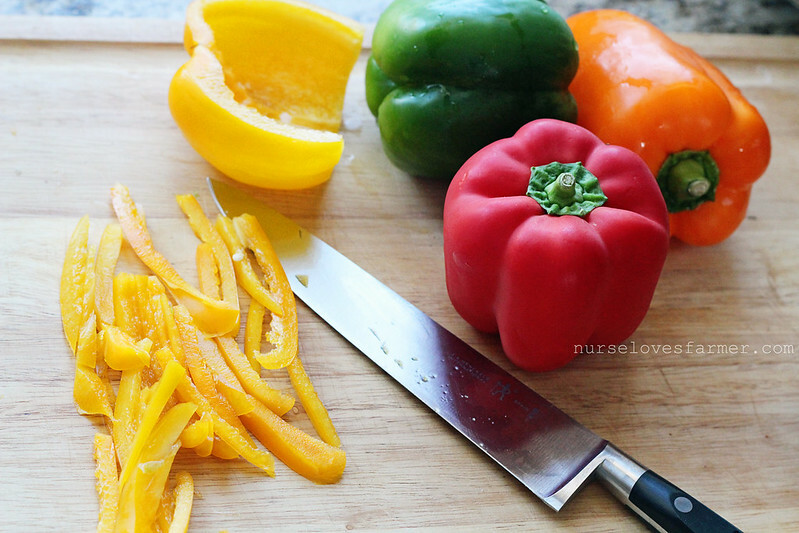 All you have to do is slice an onion and peppers thinly for your prep. Don’t you love it when your food is bright and colorful? You can either slice up your chicken breast thinly too, or if you’re in a rush and/or having a lazy day like I was when I made these, you can put your whole chicken breast into a sauce pan, cover with water and boil them. These makes for really tender chicken…and you can have restaurant quality shredded chicken for our fajitas! I know it’s not traditional to have shredded chicken for a fajita, but it still tastes great to me! This works so well for quesadillas and for enchiladas too. i'd make beef tacos – no question. love having tacos – fun to make and super tasty. fajitas all the way!! yum! I would make fajitas, we make them on the regular. Taco Tuesday! We ove tacos in this house. I would make beef tacos. We're more taco Tuesday people…I can never get enough tacos. I would make tacos on taco tuesday, there is always taco tuesdays at our house! I like Fajita Friday in my house. At a minimum, somtimes it's twice a week since it's such an easy meal. I would make Fajitas with this kit! Love Fajitas Chicken ones usually. We enjoy Fajitas ALL the time! I would make some awesome tacos! I'd make Chicken Fajitas. It is a regular meal in our house. I would make chicken fajitas. I like Fajita Fridays. Taco Tuesday. Friday's are pizza days lol. I really like a good spicy taco with lots of fresh tomatoes on it. We do tacos or fajitas once every two weeks or so. Love the spicy ones! I'd make tacos FOR SURE! My fam loves them! My recent post vote for me? and buy my camera lens? I would make chicken fajitas. I don't have a set night for meals. I would make some fajitas! They are the favourite in my house. To quote Ross, "I hope you like Mexican, because I'm making FAJITAS"!!! 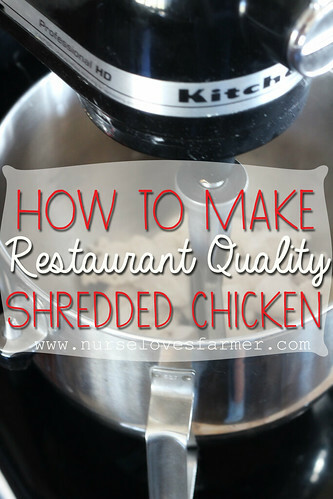 Shredded chicken in the mixer = genius! Your fajitas look amazing! I'm really into Tacos (NACHOS more so) I love mixing up my meats. Lately, its ground turkey tacos! We enjoy a lot of Taco's in our house but not always on a Tuesday, lol. We have our favourite combo which is the new Extra Mild, Super Tasty kit with added cheese, tomato, guacamole, and salsa. We would do taco tuesday. In fact, we would probably do taco any day of the week. Tacos are very popular in our family. We're definitely taco lovers here! I would make chicken fajitas or beef tacos! We don't have a specific day, but enjoy some type of Mexican food every couple of weeks!